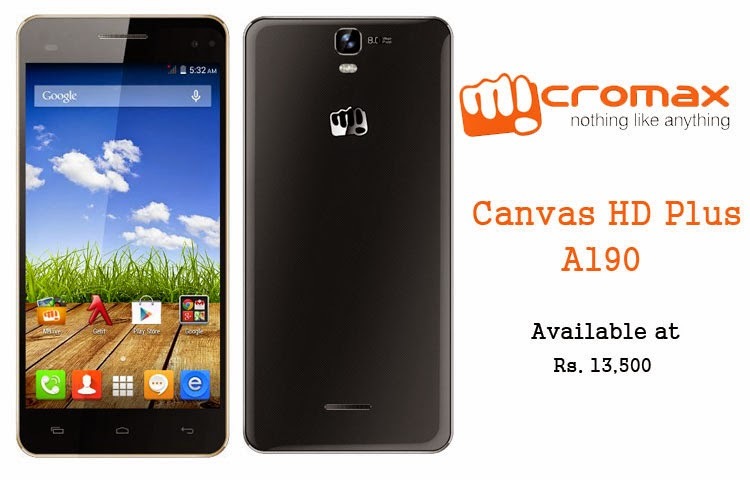 One more smart phone added into the list of Micromax after Canvas HD Plus A190 has been launched. Canvas HD Plus A190 is fully featured smart phone with android operating system. Micromax Canvas HD Plus A190 is android phone with latest version of Android KitKat 4.4.2 . Mobile has 1.5 GHz hexa core MediaTek processor which will help it to run without hanging or lagging. This smart phone also offering 1 GB RAM. This phone is having 8 Mega Pixel rare camera and 2 Mega Pixel front camera. Camera has basic facilities like auto focus. Also there is a led flash present at back for rare camera. Canvas HD Plus A190 is having 2000 mAH Li-on battery which promise to give high power backup to phone. Like other smart phones of Micromax this one is also dual sim. For connectivity this phone has all connectivity options like WiFi, Bluetooth and 3G. 1 GB RAM,8GB of internal storage and can be expandable via micro sd cards. 8 Megapixel rare Camera and 2 Megapixel front camera. Bluetooth, WiFi and 3G connectivity available. Havinf 2000 mAH battery for long lasting battery.